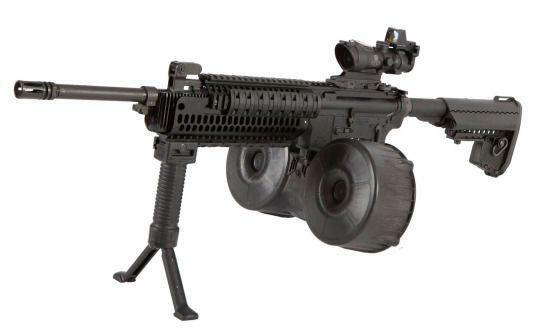 These were developed and submitted to the Marine Corps to serve as a potential replacement for the M249 SAW. From Colt: the Colt IAR features a unique heat sink system attached to the barrel, which significantly reduces the risk of cook-offs during extended periods of firing. The heat sink also provides extended barrel life over existing industry lightweight automatic rifle designs. The IAR’s ambidextrous safety mechanism provides for a positive touch & feel in safe or fire mode. I like it better than my LMG upper on the M16A1. There is a great article in Small Arms Review, Vol 20 No 8 about it. By the way, Aaron is a great guy to deal with. @BPinFL , thanks for your info as I admittingly don't know a whole lot about these. I also greatly appreciate the kind words. Feedback is important to me so thank you sir!